Patient and public involvement in commissioning is about enabling people to voice their views, needs and wishes, and to contribute to plans, proposals and decisions about local services. By involving and listening to people who use local services, our teams can better understand health needs and respond to what matters most to people. Patients and the public can often identify innovative, effective and efficient ways of designing, delivering and joining up services and this involvement is a vital part of what is known as our commissioning cycle. We conduct a range of public consultations and engagement events. We ensure there are a number of ways that you can get involved and share your views, including surveys, arranging public meetings and focus groups. We also use social media, the internet and local newspapers along with other mechanisms to share information and seek feedback. For people who don’t use the internet or email, we can make hard copies of surveys available on request and we are also able to provide information in alternative formats. In addition, we welcome invites from local groups to come along and talk about the work of CCG. 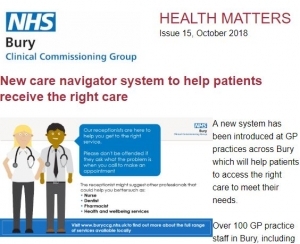 To find out more about these opportunities, or to receive more information about our work, you can subscribe to our updates through our e-newsletter called Health Matters, which is sent directly to your email address. To receive this type of information including opportunities to get involved and the latest news, please enter your name and email address below, and you will automatically be added to our mailing list. You can unsubscribe at any time by clicking the link at the bottom of any future issue of Health Matters. If you would like to get involved, but prefer to receive information by post rather than by email, please call us on the number below and we can capture your preferences and ensure that you receive relevant information about opportunities to get involved, along with our latest news, by post. If you have any queries, or would like more information about the work of the CCG, please send us an email or call us on 0161 253 7636. Read our patient and public participation annual report for 2018/19 which highlights examples of engagement activities that have taken place during the year. Access of Governing Body papers. The Governing Body meets in public every two months and people are very welcome to come along and observe discussions, or ask a question. Hard copies of the papers are available at the meeting.